The Workbook and Audio Activities contains varied reading and writing activities to reinforce all vocabulary and grammar presented in the Student Edition. Integración activities give students additional practice with reading comprehension. Tarea offers opportunities for students to practice guided writing. 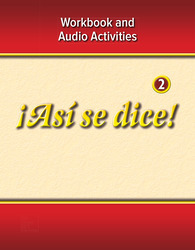 Audio Activities target both listening and speaking skills with practice that is different from those activities in the Student Edition. Audio Activities are available in audio CD and mp3 formats.